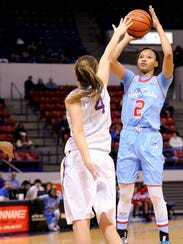 The Lady Techsters will host LSU on Nov. 11, 2016 and Auburn on Dec. 14, 2016. The game with Auburn is part of a home-and-home agreement that will send Tech on the road in 2017-18. Tech and Auburn haven’t met since 1996-97. Tech and LSU will restart a long-time series after a brief hiatus this season. The two teams had played seven straight times dating back to 2008. Although there isn’t an official game scheduled, Tech and LSU will still play in 2015-16. In an agreement dated March 27, 2015, Tech and LSU signed up to play a scrimmage Oct 31, 2015 in Baton Rouge. Tech will receive $1,500 for the closed scrimmage. There is no financial agreement for the 2016 game in Ruston. The Techsters have lost eight straight games in the series with the most recent win coming in 2003. Tech last played LSU in Ruston during the 2014 season when the Lady Tigers came away with a 81-69 win. LSU and Auburn join Stephen F. Austin, McNeese State and UL Lafayette on the 2016-17 schedule. Tech’s matchup with Stephen F. Austin is the third game of a 2-for-1 scheduled back in 2014 — a single game at Stephen F. Austin in 2014 with a pair of home games in Ruston for 2015 and 2016. Am I correct in saying that there will be no media coverage of the lsu scrimmage? Seems like there is some goofy ncaa rule about that. I think you are correct. I want to say the men's team had a couple of closed scrimmages before the start of the previous season where no media was allowed. Yeah, I don't even think they allow any public to watch. Do they even keep score? Don't think they do officially. I've not heard of a scrimmage with a team you're actually going to play though. They aren't on the schedule this year. The series picks up again next year. I really should start reading before commenting. Yep, it is closed to the public. They don't keep score...officially. Unofficially, they kinda know how close the scrimmage is. That would take all the fun out of it. I'm probably the only one who feels this way, but... that would take all the fun out of it.